I remember a larch at the border of the woods at the farm where I kept my horse, when I was growing up back in New England. At dusk these golden trees almost seemed like their own light source. I never forgot that tree. I have often thought of them that way. Now, as they pass their peak color they will lose their needles and the forest trails and roads will seem to be paved with gold. They sure stand out at this time of year! They sure do. Unfortunately the color doesn’t last long. We’ve been lucky to drive through just at this time of year. That beautiful blue sky again; such a nice contrast to the various tree colours. I love the blue sky here. At higher elevations and away from cities the air is clean and therefore looks darker blue. They are beautiful trees and their wood is very useful. They are also quite hardy and when mature are very resistant to fire. Lately they have been seeded to replace trees burned in forest fires as well as to reseed logged areas. Wow, what a nice contrast with the blue sky and gold tree! Are you seeing much color in the trees this fall out there? Because we are not. 😦 Our leaves are just drying up, turning brown, and dropping. Very little color unfortunately. Our fall colors have been very good this year, both in the trees and in the low growing brush. It’s just about over now though. I was lucky to get out when I did. Oh, that orange-brown against the blue! Yes, it really stands out. This year we have had both great color in the Larch needles and quite a bit of clear blue sky. Yes. 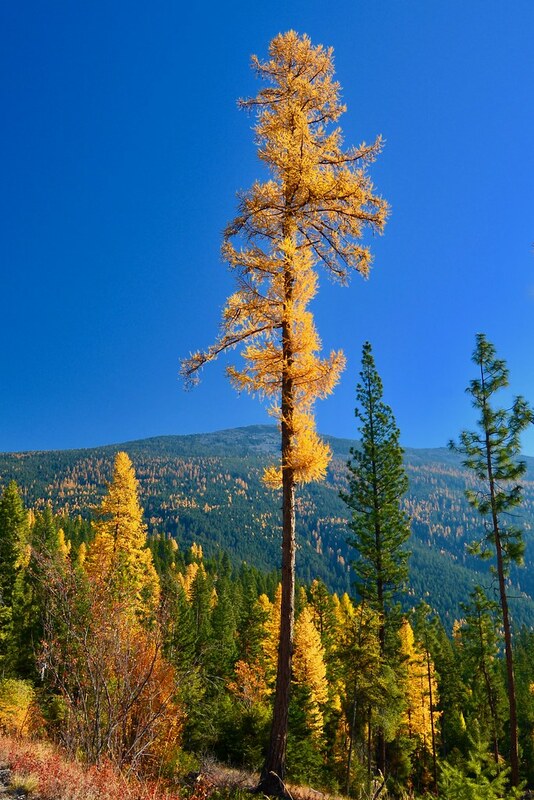 The Larch is one of about 20 species of trees that are both deciduous and coniferous. A little more compact than our larches but still very beautiful, especially against the amazingly blue sky. The mature ones are so tall that they really stand out among the other trees. The detail in the larger version is marvelous. As for color, there isn’t a maple or oak in the world that could outshine a larch in full color. They’re all pretty, but this is special.I’m so happy for you that you’ve had such glorious skies to serve as your background. I went out today and got some photos of some ridges that are covered with Larch and then a few of some Black Cottonwoods along a river. The Larch are now starting to shed their needles and the Cottonwoods are shedding leaves. Just look at those colours! Such a joy to behold!!! Out here the forest and the back country celebrates each of the four seasons with some kind of display of beauty. This is the fall celebration. Gorgeous, wish we had them in northern AZ. Unfortunately it looks like in the Salt Lake area. It is. At maturity that species will reach 200 feet in height. Thanks Matti. This photo shows a little of the size of the mature tree.